Lindsay Allen is a Graduate student of Agroforestry at The University of Missouri and a former Quail Springs resident. She will be sharing her knowledge and love of permaculture and agroforestry at Quail Springs as an instructor at our upcoming PDC for International Development Workers that starts May 21, 2017. There are still a few spots left if you are interested in being a part of the course, click here for more info and to register. Currently there are 795 million people globally who are chronically undernourished with the majority of these people living in the global south, with the largest concentration in Sub-Saharan Africa( World Hunger Education Services, 2016). Many attempts have been made both on large and small scales to address some of the root causes of undernourishment such as food insecurity, low crop yields, soil degradation, and low farmer income, but few have been successful. Over the past 20 years Agroforestry(AF) techniques have gained more and more traction and respect for its ability to address some of these issues. The adoption of Evergreen Agriculture and Conservation Agriculture by hundreds of thousands of farmers in Niger, Burkina Faso, Malawi and Zambia since the 1980s has helped create a strong evidence base for these AF farming techniques as viable solutions to increasing farmer income, decreasing food insecurity, while mitigating damaged ecosystems(Garrity et. al. 2010). A lot of the Agroforestry adoption and success can be linked back to the simple fact that this is a technology that is building upon Indigenous practices and is locally adaptable and flexible. This simple and somewhat overlooked concept in International development is exactly why AF has had so many successes where other farming projects have failed. The Green Revolution and other biotech solutions have had serious adoption issues for a number of reasons some of the main ones being that blanket technologies and inflexible solutions cannot be applied in Sub-Saharan Africa where land, soil, weather and culture are so vastly different from region to region let alone country to country. Agroforestry techniques of promoting the intercropping of nitrogen fixing trees among annual crops, the increase of organic matter in soil, integration of timber, fuel and fodder crops and the promotion of polyculture farming, allows a framework of design that can look different by region as local cultivars and tree varieties are substituted while the larger ideas are maintained. About two thirds of the small holder farmers in Sub-Saharan Africa are unable to purchase inorganic fertilizer and have little or no access to manures or other inputs for their farms. This combined with drought in many areas has led to a severe decrease or stagnation in grain crop production per hectare, with an avg. yield of 1t/ha compared with 4.5t/ha in Asia(Food and Agriculture Organization of the United Nations 2008). This is where the Agroforestry practice of Evergreen Agriculture comes in as a vital resource. Evergreen Agriculture is the practice of planting trees in and amongst food/annual crops with the aim of increasing soil health, increasing farmer income and creating a more resilient farming system. Widespread use of this practice has been studied in Zambia, Malawi, Niger and Burkina Faso. The Zambian Conservation Unit(CFU) has heavily promoted the use of Conservation Farming(CF) which emphasizes the practice of Evergreen Agriculture. CF also promotes the retention of crop residues in fields to help cover the soil, low tillage practices, and crop rotation that includes nitrogen fixation species and intercropping. Many of these practices and studies of the successes are focused around the nitrogen fixing tree Faidherbia Albadia being intercropped with Maize. This tree’s “reverse leaf phenology” make it the perfect tree to intercrop with food crops because it drops its leaves and goes dormant at the beginning of the rainy season. This allows optimal sunlight as crops are sprouting and since the tree is dormant there is minimal competition for resources. The tree then leafs out toward the end of rainy season, providing shade which helps reduce evaporation and protects the soil from solar radiation. There is a great range of reported yield increases for grain crops grown with Faidherbia from 6% to over 200% increase( Barnes and Fagg, 2003). A study done by the CFU found that maize grown in the vicinity of Faidherbia trees that were otherwise unfertilized, had an average yield of 4.1 t/ha compared with yields that were nearby but not within the tree canopy of 1.3 t/ha(Garrity et al., 2010). Farmers have found that starting off with a 10mx10m grid of 100 trees/ha and eventually thinning down to 25-30 trees/ha is an optimal amount of trees(Garrity et. al 2010). Fadherbia has a long tradition of being grown in Malawi as well and has been being researched since the 1980s by the Agroforestry Commodity team, part of the Government’s Department of Agricultural Research and technical Services( Saka et al. 1994). Their research in the Lakeshore Plain region of Malawi found a 100-400% increase in maize yields grown under Fadherbia trees( Garrity et al. 2010). Three other important nitrogen fixing trees/shrubs have been studied in Malawi, Gliricidia, Sesbania sesban and Tephrosia. Maize grown with Gliricidia was found to yield more than 5 t/ha in a very good year and 3.7 t/ha on average with no additional fertilizers compared with average yields of .5-1 t/ha in the control plots grown without mineral fertilizer or Gliricidia (Akinnifesi et al. 2007). Sesbania and Tephrosia are a shorter lived, fast growing tree that is grown and reincorporated back into the soil within the first year, providing a quick supply of nitrogen and carbon sequestration for the farmer. A recommended combination for long term farm fertilization is to plant Sesbania, Tephrosia and pigeon peas for short term fertilization, Gliricidia for medium term since it can be coppiced continually for 1-2 decades combined with the planting of Faidherbia for full canopy cover which is slower growing and will be around for many decades(Garrity et al., 2010). 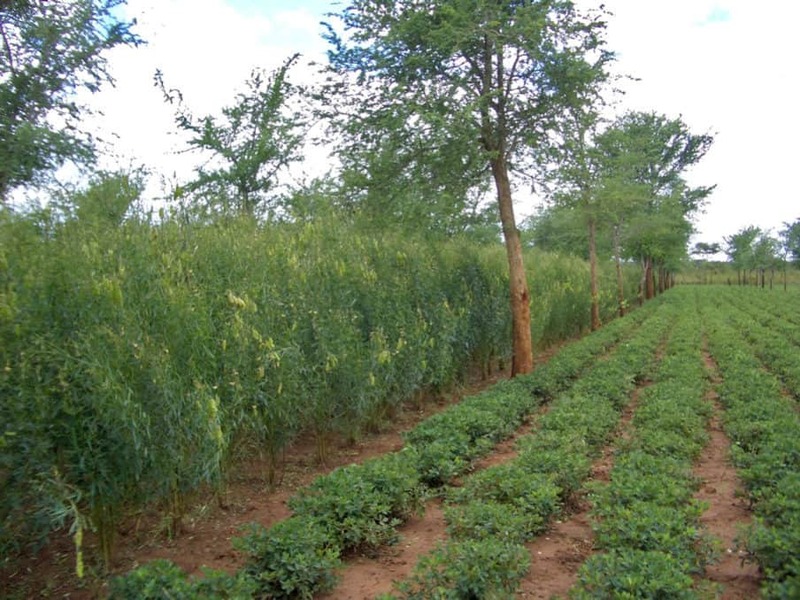 In addition to increasing yields and soil fertility Gliricidia, Tephrosia and Faidherbia have the added benefit of suppressing weeds, sequestering carbon and increasing water infiltration, making these trees an invaluable farm resource. Based on the results of the various studies that have been conducted since 1980s Malawi launched an Agroforestry Food Security Program in 2007. This program in partnership with local NGO’s provides tree seeds, nursery start-up material and AF trainings. In just two years this program trained 120,000 farmers and with the help of the Irish Government has now expanded to 40% of Malawi’s districts, involving around 1.3 million people(Garrity, 2010). The AF Food Security Programme is also promoting the integration of fruit, fuel wood, timber and tree cash crops in with annual maize and crop production in order to increase farmer income and diversify farm risks. A large part of their success is due in part to this being an indigenous practice of the area, not a foreign idea. Its success can also be attributed to the strategic targeting of working with women and farmer groups and taking a whole village approach to training and mobilization(Garrity et al., 2010). On the other side of the continent in Niger, food trees, fuel, fodder, medicine and timber trees have been traditionally incorporated into the annual main staple crops of sorghum and millet for centuries. However in the 1970s and 1980s due to drought, population pressures and non tree supportive government policy there was a large loss of the traditionally wooded farm lands. Farmers had traditionally practiced what is known as Farmer Managed Natural Regeneration(FMNR) which is the observation of helpful trees naturally growing on one’s land/farm and letting them grow where they were naturally seeded by birds or other animals. Farmers traditionally allowed 10-50 trees per hectare to regenerate this way on their farms. Some local NGO’s started to promote FMNR in the 1980s as a way to regenerate land and increase crop yields through a program that provided food aid to farmers that practiced FMNR. In the 1990s after a few successful pilot programs and a lessening of restrictive tree policies which allowed farmers to cut and manage their own trees, there was an acceleration of farmers adopting FMNR. This led to the regreening of large areas of Niger using FMNR with the main tree being Faidherbia. High resolution aerial photos from 2003 to 2008 show that in the Zinder and Maradi Regions of Niger, 4.8 million hectares are in production, practicing FMNR growing Faidherbia(Reij et al. 2009). This large transformation of the landscape has been estimated to provide 500,000 tonnes of additional food every year. Since the 1980s Nigers population has nearly doubled, yet it has been able to maintain its per capita production of millet and sorghum, the main staple of villagers diets( Reij et al. 2009). A similar story played out in neighboring Burkino Faso following massive droughts and farming failure in the late 1960s and early 70s. Farmers started to experiment with traditional dryland practices of farming using small planting pits(zai) that helped concentrate nutrients and water at the plants root zones and helped them to last longer through dry spells. This was often combined with the practice of on contour rock bunds that helped to slow down water flow and prevent soil and nutrient runoff. As of 2004 an estimated area of between 200,000 and 300,000 hectares of land have been rehabilitated, with an average increase of cereal grain production of 40-100%( Reij et al. 2009). Where Agroforestry has been implemented in developing countries it has seen widely successful in targeting malnourishment, increasing farmer income and reducing farm systems risks, while helping to restore degraded landscapes. Some of the major things that have hindered or slowed the spread of AF practices are, non supportive government tree ownership policies, tax incentives going to large commercial cattle ranchers to clear forests, policies promoting the increase of international cash crop sales by the International Monetary Fund and massive scale logging for timber(Gold, 2017). Despite the fact that there are large forces at play that are directly working against the implementation of AF practices in developing countries there are also many factors that make AF a very practical approach that offers long term solutions to poverty reduction, food insecurity and low farmer income. Unlike many of the larger approaches to solving these issues, AF is a low tech solution that builds on the indigenous practices of the area and focuses on community level implementation and knowledge dispersal. To date Agroforestry has helped restore millions of hectares of degraded land and increased food production on millions of farmers land in Sub-Saharan Africa. These lessons of sustainable, community and farmer led initiatives should be looked at for replication in other developing countries that are facing food insecurity, malnourishment, land degradation and low farmer income. Food & Agriculture Organization of the United Nations (2008). FAOSTAT database. Production: Crops. Available:http://faostat.fao.org/site/567/default.aspx. Accessed April, 2017. Garrity DP, Akinnifesi FK, Ajayi OC, Weldesemayat SG, Mowo JG, Kalinganire A, Larwanou M, Bayala J (2010) Evergreen Agriculture: a robust approach to sustainable food security in Africa. Springer Science+Business Media B.V. & International Society for Plant Pathology 2010. Policy Research Institute. Republic of Malawi (2008). “2016 World Hunger and Poverty, Facts and Statistics.” Fact Sheet. World Hunger Education Service. Washington D.C. 2016. Web. Would love to contact Lindsay Allen to request permission to reprint her essay on The MOON. Thank you! go on blessing you. i enjoyed the opportunity to met the 5 of you at Tina’s Diner tonight. This article has been very helpful with information I’ve had a hard time locating, and I am hoping that I might be able to get some more information. I have involvement in a children’s resource center in kenya, and have bought land to help feed these kids. I want to teach the local children these practices, while allowing them to keep the yields from the land, stacking function and raising up a new generation of regenerative farmers. Is there a resource I can obtain to help this plan become a reality? 720-289-6070 call or text is good, or email. Thank you again!